NEW YORK, September 15, 2010—The Sheila C. Johnson Design Center (SJDC) at Parsons The New School for Design presents Living Concrete/Carrot City, an exhibition that explores the role of design and grassroots activism in the development of urban agriculture, and its effect on neighborhoods, health and the environment in cities such as New York. "Living Concrete/Carrot City is at once a public forum, a teaching tool, and a design showcase," said Radhika Subramaniam, director of the SJDC and co-curator of the exhibition. "In inviting farmers, designers, artists, media advocates, researchers, and students to think together, we aim to cultivate a conversation on urban farming that functions as what artist Joseph Beuys called 'social sculpture', a mixture of creative action and social transformation." The exhibition is a dialogue between The New School and Ryerson University in Canada. Living Concrete examines urban food initiatives and their impact on local communities—from backyard community plots, roof gardens, and farmer's markets to urban farms—through projects undertaken by New School students and faculty. The exhibition features maps, installations, interactive websites, videos and models, several created specifically for the show. Highlights include a "field guide" to local food on the Lower East Side; a participatory project to re-design bodegas; sound and video installations that explore urban beekeeping; and a multimedia piece on Corbin Hill Road Farm, an innovative venture where families in the South Bronx own shares of an upstate farm. Carrot City: Designing for Urban Agriculture, curated by Mark Gorgolewski, June Komisar and Joe Nasr from Ryerson University, explores the interchange between urban farming and design, and showcases innovative projects such as grow bags that enable city dwellers to create gardens on any terrain. Carrot City demonstrates how new developments in agriculture impact urban design and how design, in turn, can facilitate a more robust urban food system. "This exhibition is about more than just the ability to grow food in cities; it is about the social interconnections of the people involved in food production," said Living Concrete co-curator Nevin Cohen, Chair of Environmental Studies at The New School and co-director of the Tishman Environment and Design Center. "Urban farming is integral to the sustainability of our cities, and the projects showcased here demonstrate the civic dimensions of this process." As part of the exhibition, Cohen will lead students through a research project that will map out New York City's food system, identifying interesting patterns in food production, distribution and consumption. 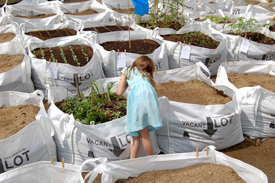 The project, which will "grow" over the course of the exhibition, is part Cohen's fellowship with the Design Trust for Public Space, where he is helping to develop a citywide plan for urban agriculture in partnership with Added Value, a large community farm in Brooklyn, and city government. "It is fitting that the first destination of Carrot City as it travels from Toronto is New York City, as both cities are at the forefront of design for urban agriculture," said Joe Nasr, co-curator of Carrot City. "At The New School, we find the same vibrant interest in the subject that we have found at Ryerson over the past few years." Living Concrete/Carrot City will feature a "platform for public pedagogy," a space that will host weekly lectures and panel discussions. Sessions will include "Food Design and Social Change" (Oct. 6), featuring several New York City urban agricultural leaders, including Karen Washington, President of the NYC Community Garden Coalition and Dennis Derryck of Corbin Hill Farm; and the launch of Robert Gottlieb's new book Food Justice, introduced by Majora Carter (Oct 14). Other speakers through the fall include Erika Allen of Growing Power, Stella Chao from the Seattle Department of Neighborhoods, Gabrielle Langholtz of Edible Brooklyn and Edible Manhattan, Katy Keiffer from Heritage Radio Network, and Marion Nestle, among others. For the full schedule of events, please visit the SJDC website. Living Concrete/Carrot City is made possible, in part, with the generous support of the Andrew W. Mellon Foundation, The New School Green Fund, and the Office of the Provost Academic Events Fund. It is a collaboration among faculty and students from several divisions of The New School, including Eugene Lang College The New School for Liberal Arts, Parsons The New School for Design, and The New School for General Studies. The Sheila C. Johnson Design Center is an award-winning campus center for Parsons The New School for Design that combines learning and public spaces with exhibition galleries to provide an important new downtown destination for art and design programming. The mission of the Center is to generate an active dialogue on the role of innovative art and design in responding to the contemporary world. Its programming encourages an interdisciplinary examination of possibility and process, linking the university to local and global debates. The center is named in honor of its primary benefactor, New School Trustee and Parsons Board Chair Sheila C. Johnson. The design by Lyn Rice Architects is the recipient of numerous awards, including an Honor Award from the American Institute of Architects. For more information, please visit www.newschool.edu/parsons/sjdc. The Tishman Environment and Design Center at The New School (TED) oversees the development of environmental studies at the university and supports research and public programming. The center works to establish environmental literacy as central to an undergraduate education at The New School and to frame environmental challenges at the intersection of design, and the social and natural sciences. For more information visit www.newschool.edu/tedc. Ryerson is Canada's leader in innovative, career-focused education. It is a distinctly urban university with a mission to serve societal need, and a long-standing commitment to engaging its community. Since 1948, Ryerson has built its reputation on the strength of its academic curriculum, and offers close to 100 PhD, master's, and undergraduate programs, with a total enrollment of 25,000 and more than 65,000 registrations annually in The G. Raymond Chang School of Continuing Education. For more information, please visit www.ryerson.ca.